In case you’re unfamiliar with the tradition, the color company Pantone annually chooses a color of the year that will be the highlight in clothing, home décor, beauty products, and all types of accessories. This year’s choice is a cosmic purple called ultra violet. It symbolizes inspiration, imagination, and meditation. 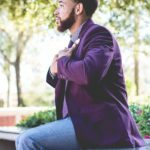 This purple hue is perfect for springtime, so go ahead and incorporate it into this season’s wardrobe in the following ways. Are you the type of guy who prefers a hint of color, especially when it’s different from what you normally wear? If so, then stick with small, less noticeable accessories such as watches, wallets, belts, cuff links, rings, and socks. They give you a subtle touch of ultra violet but enough to still work as conversation pieces because of the unique shade. You’ll be able to catch attention without having to don yourself completely in purple. You can also remove or swap out these items easily to change your outfit with little effort. When next year’s color comes around, you won’t have to update your entire wardrobe either. For those of you who like to make a statement, then go all out with ultra violet clothes. The simplest and safest route is a top, but if you really want to stand out, then think outside the shirt. Go with a blazer, dress pants, or a whole suit in Pantone’s pick. A spring jacket or sweater is a middle ground because you can take it off whenever you like. Do you only want to turn heads in a non-professional setting? Then sport ultra violet in your workout gear or loungewear instead. What do you think about Pantone’s 2018 color of the year? Would you wear ultra violet and how? Leave a reply below with your thoughts and fashion tips!